The Laurel & Hardy Project #12: Sailors, Beware! The boys’ ninth film of 1927, released barely two weeks after Sugar Daddies, finds them on an ocean liner. 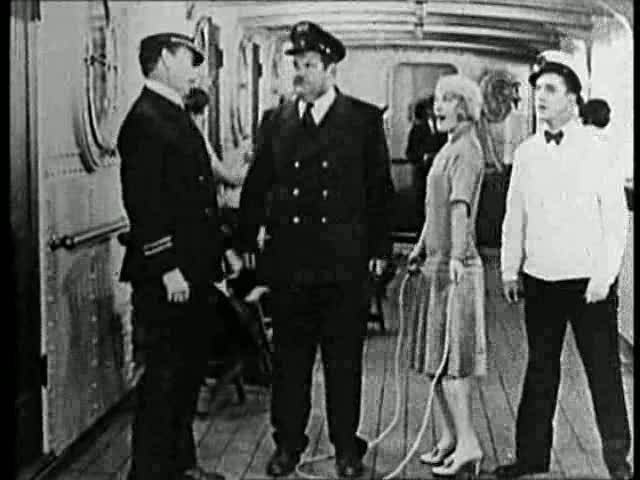 Hardy is the ship’s purser, enamored of the ladies but pretty much sidelined for most of the film. 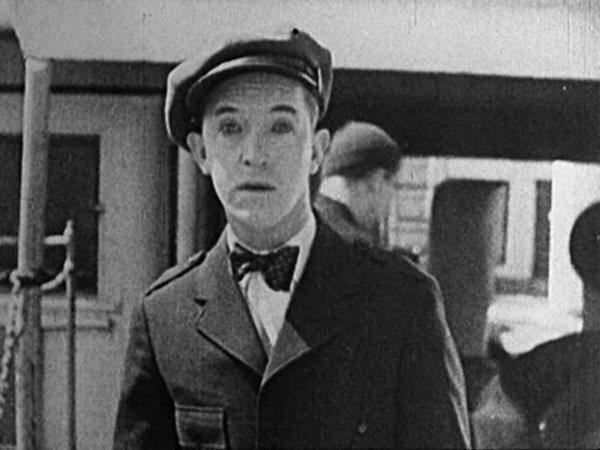 Laurel plays a taxi driver who finds himself mistakenly aboard ship (his parked cab is loaded on the liner while he’s attempting to put out a cigarette fire in the backseat) and forced by the captain to work as a steward. 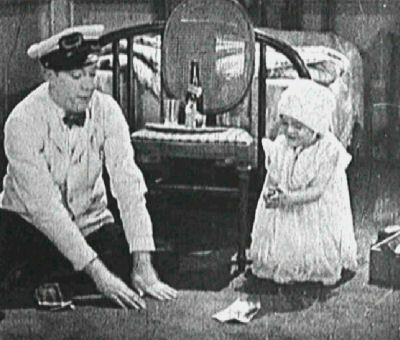 The villains are a thief and her husband, a dwarf (Harry Earles) who dresses like a baby to help with the crimes. Most of the film chronicles Laurel’s fights with Earles: the two become antagonists after Laurel loses five dollars to him playing craps with what he later discovers are loaded dice. Earles is particularly hilarious, you probably know him best as Hans in Tod Browning’s classic Freaks where he is victimized by an evil trapeze artist. His baby-as-grifter is performed beautifully and the times when he one-ups Laurel leading to the now-trademark “weeping face” provide a clever contrast: one grown man dressed like an adult but acting like a baby, one grown man dressed like a baby but acting like an adult. Laurel’s character is more sharply edged here than in any of the previous films. He’s a bit smarter and a bit meaner. One great little sequence finds him at the ship’s pool where a fancy rich lady walks up to him and haughtily gives him the cold shoulder. In turn, he calmly pushes her into the water. Her indignant boyfriend rushes up to him shouting, and he pushes him in too. This kind of chaotic malevolence is new for the Laurel character, who in most of the previous films has been more of a naive rube. The capper to the scene provides Hardy’s best moment: after Laurel runs away, he bumps into Hardy and tells him the girl in the pool wants to see him. Hardy rushes to the pool only to be doused with buckets of water. In response, he looks directly at the camera, wearily sighing. This is the first instance I can recall of this kind of fourth wall-breaking aside, but I suspect it won’t be the last. The film as a whole doesn’t really hang together all that well. In the opening we see a feuding rich couple (one of whom is played by Lupe Velez) who disappear from the rest of the film, and Hardy really isn’t given much to work with (the horniness of his character as established in the opening never pays off, so to speak). But the individual gags are pretty great, and I don’t know, if you don’t think Harry Earles smoking a cigar dressed as a baby is funny, or the thought of Stan Laurel pushing said baby in his cart down a grand staircase in a gleeful moment of Eisensteinian destruction doesn’t make you laugh, then this film probably isn’t for you.